The guild has twenty members, many of whom have been guild members for twenty to thirtyyears and all of whom enjoy arranging flowers. We provide arrangements on pedestals in the nave and porch on a weekly rota following the church calendar and fully decorate the church for festivals, Easter, Harvest and Christmas. 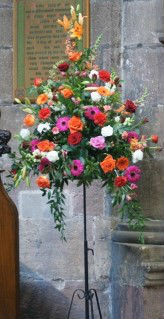 We also provide special arrangements for The Remembrance Day Service. We liaise with families when requested for memorial, anniversary, special occasions, weddings, funerals and baptism flowers in church. We also make and donate the posies for Mothering Sunday which are handed out by the children of the congregation. At harvest the small arrangements we provide are taken to the sick and elderly in the community.